CSKA made a display of strength against Unics Kazan in the VTB League derby of the Week. Thanks to a powerful output in the first quarter, CSKA Moscow defeated Unics Kazan 80 – 63 at home, perhaps more easily than what the final score implies. Following their EuroLeague loss to Zalgiris Kaunas, the “Army Men” entered the game in an all-guns-blazing mode, leaving their opponents behind 23 – 9 (!) after 10 minutes. 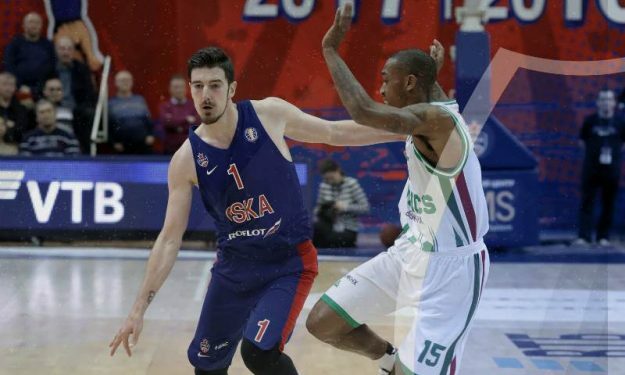 Unics improved their offense a bit in the second period but CSKA kept its engines running at full speed to gain a 24-point lead (64 – 40), seven minutes into the second half. The rest of the match was just a standard procedure since Unics couldn’t erase such a margin. Othello Hunter led CSKA with 14 points in just 16 minutes while Nando De Colo scored 12 and dished out 6 assists. Cory Higgins also had 12 points for CSKA. Trent Lockett and Maurice N’Dour stood out for Unics with 13 points apiece plus 8 and 9 boards respectively. In the rest of VTB League games that took place this Week, Joe Ragland pushed Lokomotiv Kuban past Astana while Charles Jenkins did lots of work on both ends, as an Alexey Shved-less Khimki beat Kalev Tallinn.